Sea of Glass: Partner - 8th Annual Bead Soup Blog Party! Been a couple of years since I participated in the Bead Soup Blog Party, so I decided to sign up for this one. Thanks to Lori Anderson for hosting it, and doing ALL of the work to make it happen. This year, there are 490 participants from all over the world! Amazing lady. Partners will exchange beads and clasps, and other findings, then each will create one or several pieces. The "reveal" day is May 3rd, when we post photos of finished work, and spend hours perusing blogs for our viewing pleasure of eye candy! 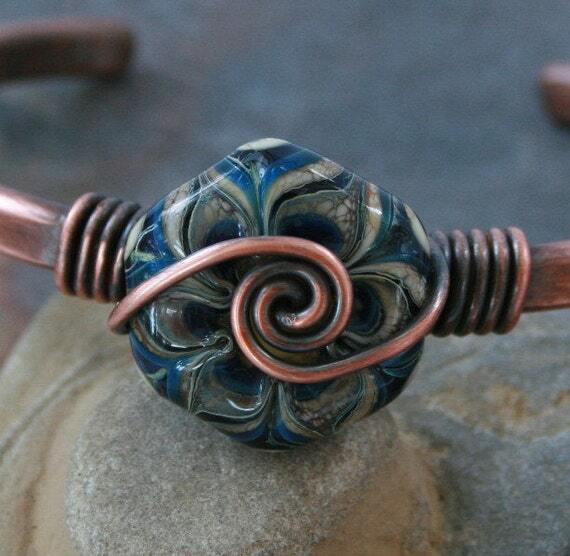 Cindy is a fellow glass bead maker, and I noticed she also works with metals. Here's an example of her work: I chose a favorite to show from her etsy shop. If you want to see more of her unique offerings, click the bracelet. Stay tuned for the soup exchange arrivals! Hi, Cynthia.....maybe neither one of us has particpated since we were last partners. I hope you enjoy this PARTY and your partner. You gave me quite a CHALLENGE!!! Still waiting to see who I will have as a partner. Off to the beach tomorrow to play with my beads in anticipation of getting my bead soup ready! Enjoy!!! Hi Cynthia! I'm working on all of the yummy ingredients for this years bead soup. I hope I stir up something you will devour!